Elite dancers say to make the transition between mediocre and exceptional one must ‘be the dance’ rather than ‘doing the dance’. The same principle clearly applies to Kyokushin Karate. At least that was my main conclusion after spending a weekend attending the Kyokushin Training Camp in Prince George last weekend with six of my fellow representatives of the Chujitsu Dojo in Dawson Creek. It was our dojo’s first training session with IKOK Branch Chief Shihan Stuart Corrigal, his brother Shihan Don Corrigal and a number of other IKOK Canada representatives so were all striving so hard to make a good impression. Friday night’s session involved a couple of hours of basic Kihon and a little bit of Ido Geiko. That seemed to go well…. “be karate, don’t do karate!” When performing the familiar it is easy to keep this facade going. A slightly different regime of when to shout ‘Osu’ unbalanced us newbies a bit, but otherwise, it was a great session of energetic and frenetic activity. Things went a bit out of our comfort zone Saturday when we began some Ido Geiko routines… unfamiliar Ido Geiko routines. We knew the Kihon, but the combinations were foreign. It’s easy to be in that Mushin state of ‘being karate’ when the routines are familiar and practiced, but when they are new unpracticed routines… yikes! I was definitely suffering that disconnect between my brain and my body that Shihan Stuart talked about. Then we switched to Happo no Kuzushi… a routine we had been fleetingly introduced to years ago and now we were really struggling to keep up. So what can you do? ‘Don’t watch other people… just do it by the techniques’ Shihan said. My brain went to Zabaglione… nothing there but whipped egg white, sugar and Marsala. I remember a video of Sosai training on the beach in Japan surrounded by hundreds of other students doing Pinan Ichi… when he reaches step six he punches Jodan Tsuki instead of blocking Jodan Uke… he looks around to see if anyone noticed then switches to the proper technique. It’s a great reminder. We’re all striving to be better. Sunday was more of the same… the answer was simply to train as hard as we could and enjoy the ride. 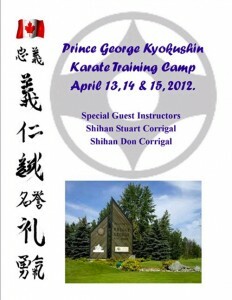 Excellent first training camp in Prince George with Shihan Stuart Corrigal, Shihan Donald Corrigal, Sensei Dean Bawtinheimer, Sensei Jarvis Thompson, and a Nidan and at least eight Shodan’s and many lower ranks. The noise of more than 40 adults in one small dojo all Kiai-ing at the same time was fantastic. One big unit and one big Osu. The sound and the training was inspiring. Lots of Kihon and some excellent stretching thanks to Sensei Dean Bawtinheimer to get things started. Sensei Bawtinheimer showed me where my flexibility needs to be and the different stretching techniques were definitely appreciated. Lots of kicks meant the legs were sore for a day or two after training, but it is a good pain and well worth it. Several fighting exercises that didn't really seem like kumite until after the exercise was finished and Shihan Stuart explained what we had actually been doing. Lots of different Ido Geiko to get the mind and body a little confused, but helped to show that the body, mind and spirit all have to work together. These Ido Geiko also showed how many variations there are on the basic techniques we learn in our Kihon, and that it will never get boring. Just when you thought you had the hang of it, Shihan would add something as simple as not using the same technique twice, or starting on the right side instead of the left and suddenly it became a new Ido Geiko, more confusing and more fun. We learned Happo No Kazushi, all 32 moves (may take some time to remember them all in a row), thanks to some excellent technique again from Sensei Bawtinheimer. Shihan Stuart and Shihan Donald showed an enthusiasm that spread through the class and Shihan Donald showed just how simple but effective Goshin jitsu can be. After more than 40 years of training it was easy to see how Shihan Stuart and Shihan Donald are still excited about Kyokushin. There is always something new to learn and get excited about. Although the work was hard and there were many cringing faces at different times during the Gasshuku, at the end of the camp, and after all the hard work, all the faces were smiling. I can't wait till the next camp. Thanks to Sensei Jarvis Thompson, head instructor from Prince George Kyokushin Karate Dojo, for hosting the Gasshuku and inviting the Shihan’s.